Small, one-bite appetizers for a small get together. 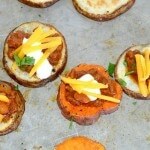 This recipe for Smokey Chili Potato Bites has chili topped with cheese served over a crisp baked potato wedge with a cool creamy Chobani yogurt dollop. One of my most commented on recipes was Cranberry Pistachio Spread on top of Sweet Potatoes I don’t know if its because of the fact that its on baked sweet potatoes/russet potatoes or because it was so simple to make. I knew I had to try other things along this line because I absolutely love recipes that are easy, quick and filling and obviously you do too! HOW DO YOU LEAD A FULL SCHEDULED LIFE AND FIND TIME TO ENTERTAIN?? 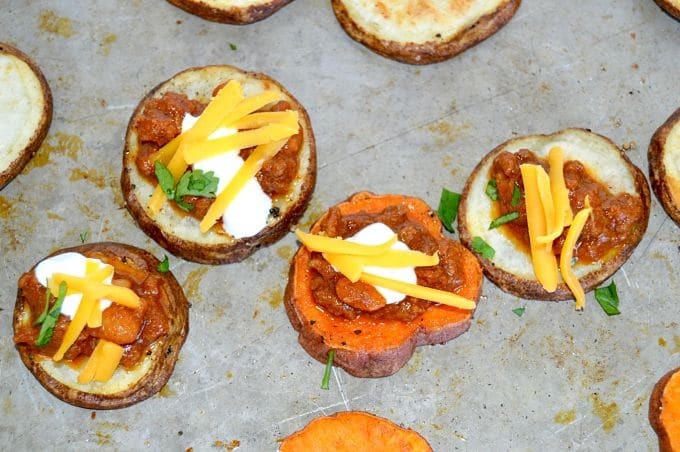 Smokey Chili Potato Bites are an appetizer that makes a 2-fer meal out of leftover chili. Sometimes you want to have people over for a get together but life is just plain non-stop and you wonder how in the world you’ll have time to entertain? 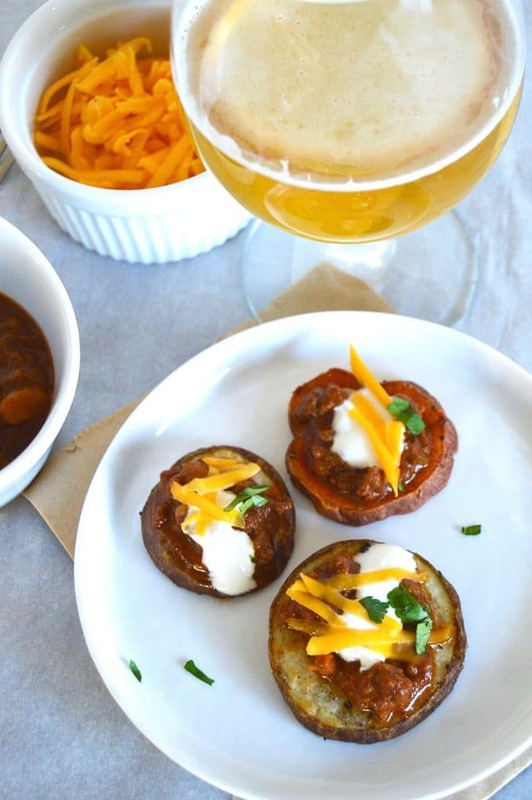 Earlier in the week make my recipe (or your family favorite) chili recipe for dinner and save the leftovers to serve as a topping on these Smokey Chili Potato Bites. I always double my chili recipe because it always amazes me that it goes so quickly. If you don’t have the time to make the chili recipe Ive given you, try this recipe from Gluten Free Pressure Cooker for Instant Pot Chili. 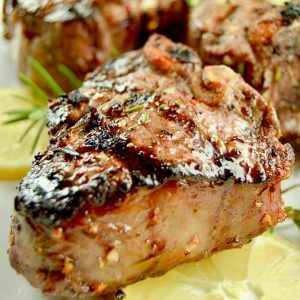 It will be ready to eat, and you won’t believe how flavorful it is. 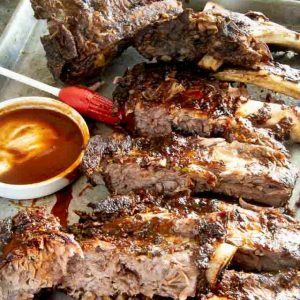 This recipe is so perfect because you’ll have plenty of time for all of the things you need to still get done before company arrives, get to that meeting, clean the house, run errands and still have an impressive spread ready for your guests. Once they are out of the oven it takes less than 10 minutes to assemble, plate and serve them to your guests. Wash both potatoes thoroughly and cut into round slices about 1/4" thick. (I don't peel the potatoes because it keeps the bite more stable once bakes if you leave the skin on. Place into a bowl and toss with olive oil to coat evenly. Lay flat on top of a metal cookie sheet and season with Salt and Pepper. Continue to bake for 15 minutes until golden brown and crispy. While potato slices are baking, reheat the chili to a hot temperature. Once potatoes are golden brown, remove from oven and place 1 tablespoon of chili, then 1 teaspoon of yogurt and lastly sprinkle cheddar cheese over the yogurt. Smokey Chili with a deep warm flavor. Packed full of ground beef, perfect alone or as a topping on your favorite baked potato! Measure out all spices and herbs, place in one small bowl. stir to mix evenly. Set aside. Place a large stockpost on the stovetop and heat to high. Once pot is hot, add olive oil and swirl evenly over bottom of pan. Add onions and cook until translucent, about 5-7 minutes, frequently stirring to prevent burning. Add ground beef, continually stirring until meat is cooked completely. Remove pan from stovetop. Return meat mixture back to pot, and place back on the stovetop. Add tomato paste and stir until completely mixed evenly. Once tomato paste is completely incorporated pour spice/herb mixture over meat. Add chicken broth and strained beans, increase heat to high and bring to a boil. Once chili is at a boil, reduce heat to a simmer and cover. Cook for 2-3 hours until meat is very tender and broth has reduced so that it is about equal parts liquid to meats. Serve with tortillas, cheese and or fritos. Smokey Chili Potato Bites above. I love finger foods!. This is perfect for game day. These are perfect for this cold snap we’re having – I’ve been looking for new things to bake and everyone here adores chili – great idea! I love that you used yogurt instead of sour cream! I would have never thought of this flavor combination! Awesome that you use sweet potatoes as well! Yummy!! I also love to double my recipe so I have plenty of leftovers! Why not? Good idea on the leftover chili. Oh wow so unique and they look great! I love mini foods! I know, why is it that mini foods just make me happy? Thanks for stopping by April! Heck yeah! perfect for this weekend! I fully believe that it is very hard to screw up a potato recipe. 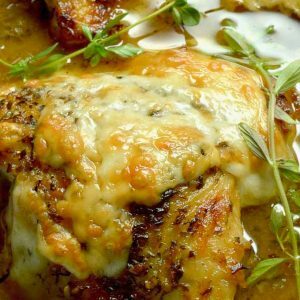 Potatoes are amazing and this recipe just made me crave them! OMG I love bite size foods and these look simply DELISH! Wish I can grab one off the screen right now! WOWSA! 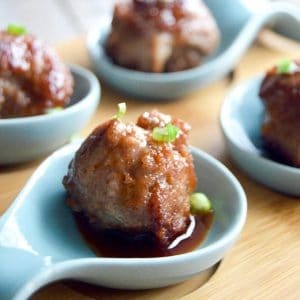 These little potato bites look especially good for cold weather; we’ll be putting some of these together this weekend for sure!